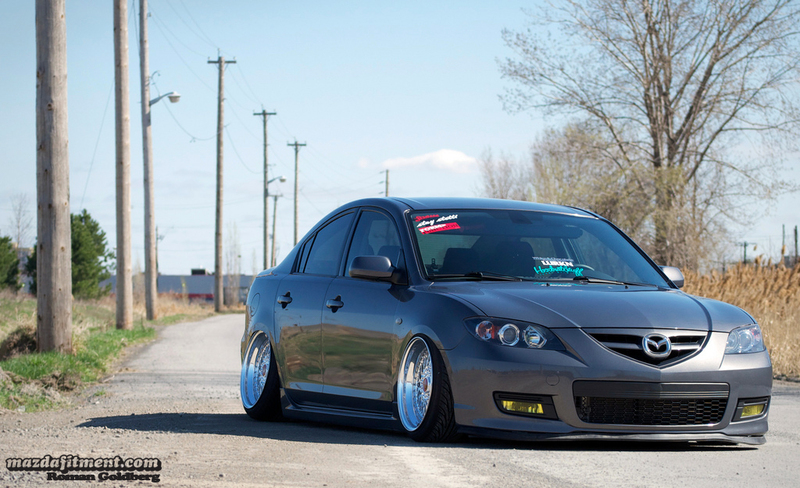 Here we are in Montreal, Canada to share with you this incredible build on Sam Mahmassani’s 2007 Galaxy Grey Mica Mazda 3 Sedan GT. What makes it incredible? The owner, the suspension build, and the overall appeal of the car. Sam was previous on coilovers, but due to the fact that the roads in Montreal were not the best and it limited his own travels on daily, he made the switch over to an air setup. As a result, Sam was able to over come these obstacles and to go even lower. Sam is tucking wheel in the rear and is also able to do it in the front, however, due to the fact that the front is a little too wide and the camber adjustment in the front is maxed out, he is not able to do that right now. But, will be able to in the future as he tweaks his setup. From the rear. That right there is -7 degrees of camber. For your information, camber is not what shreds the life of your tires, it is the toe. When your toe is not at zero or even close to it, it will drastically effect the wear of your tires, and combined with running negative camber it can be deadly. So, remember toe adjustment is important, and will return life to the tires when running a setup like this. 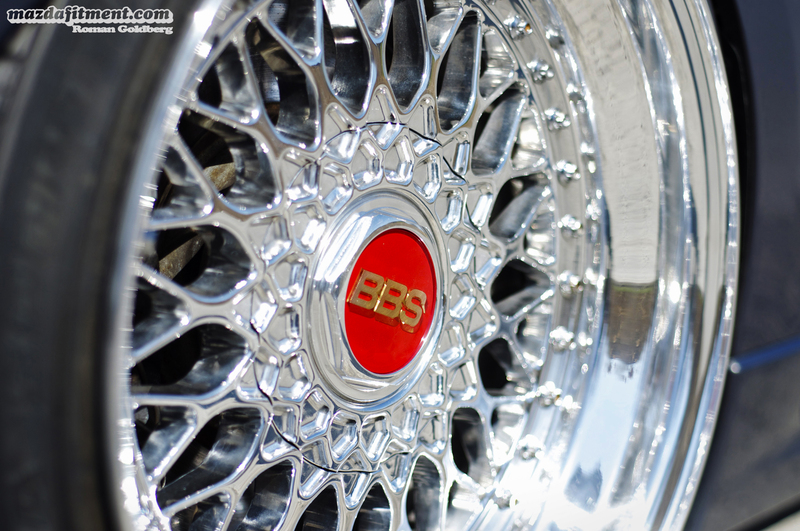 17 x 9 +12 Custom Built BBS RS – 3″ Polished Lips with Chrome Faces. Sam on the highways of Montreal. Breaking necks with his stunning setup. Hope you enjoyed this sedan, and see why this build stands out. Thanks to Sam for letting us share his ride and Roman for getting it shot for MazdaFitment.com. The rest of the pictures are in the photo gallery below. Enjoy. what kind of lip does he have!!! My inspiration for my own car, never see many done up sedans. 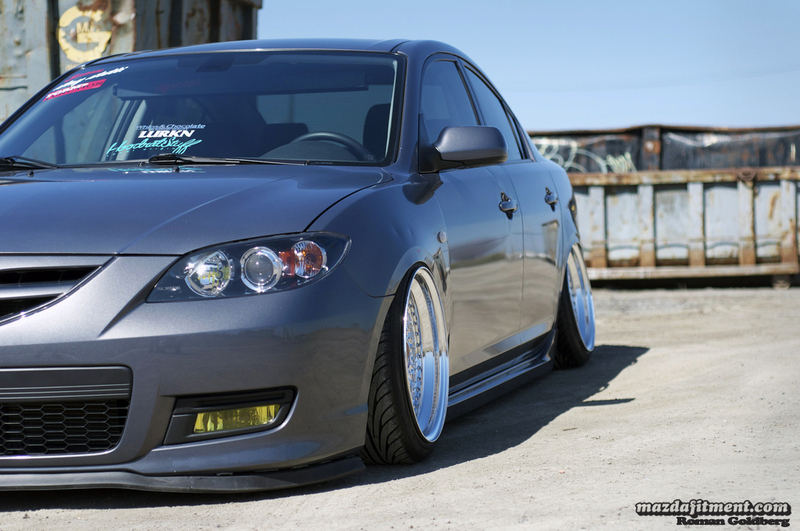 Hopefully when I finally start working on my car, it will look as good as this. Go Canadians!